It is a hugely powerful process developed by the Institute that we use in all our programs, consulting, and executive coaching to guide leaders through a personal re-invention experience that will enable them to achieve breakthrough results in their jobs and careers. A person’s context is the unconscious mindset from which they operate. It is shaped by their personal experience (e.g., childhood events, family beliefs, education and social conditioning) and the character of their organization (e.g., its culture, values, traditions and past leadership). Nothing ever happens to us except what happens in our minds. Leading by Context™ shines a light on one’s blind spots and supports the individual in choosing a new context that will enable them to “trade up“ and achieve the next level of greatness. When leaders within an organization experience this transformational re-invention together they are more supportive and accountable for sustaining the change. 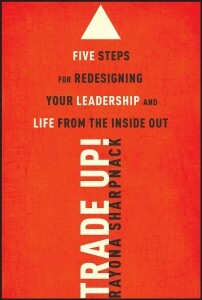 Designed specifically for organizational leaders, this intensive applies the principals in Rayona Sharpnack’s book Trade Up! to accelerate leadership development, increase career success, and improve quality of life.